We have written on excluded drivers and excuses insurance companies make. At Mac Hester Law, we know the way the insurance companies act. Also, we know the process used after an accident occurs. In designing this flow chart, we wanted to make it easy for you to understand. 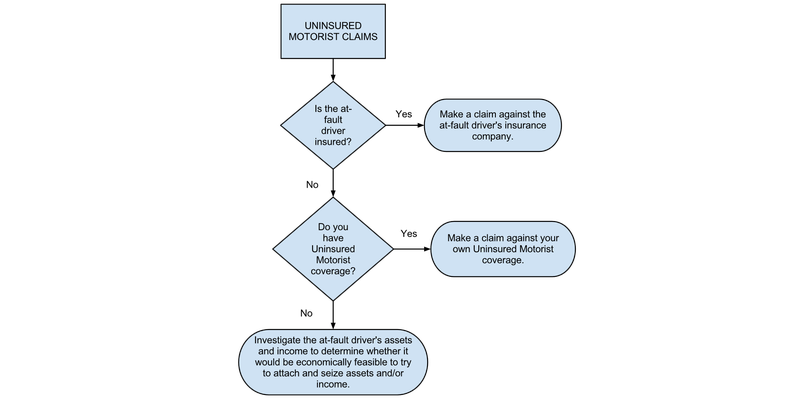 The uninsured motorist flowchart is meant for you to easily understand what happens when the insurance company says yes or no. Uninsured motorist can cause problems to insured drivers. There are several yes/no answer which you will receive from the insurance company. This flowchart should help you to understand and make informed decisions. We lay out the way drivers who are uninsured can affect your insurance claim and possibly what to do when you finally receive the answers from the insurance companies. Driving in Colorado is an unpredictable situation. Weather can impair our driving in the winter with snowstorms and the summer with blind spots. As Coloradans, we know the risks, but sometimes we need to be reminded of some simple steps to take while driving. Mac Hester Law has a list of do’s and don’ts on our website and we wanted to share some of them here. DO call your insurance coverage that is available to you: e.g., medical Payments coverage, uninsured motorist, underinsured motorist, health insurance, etc. DO NOT agree to be interviewed by the at fault driver’s insurance company about the accident and your injuries. It is okay to discuss getting a loaner or rental car and your car repaired or replaced. DO NOT trust the at fault driver’s insurance company to treat you fairly or to compensate you fairly for your injuries. The at fault driver’s insurance company’s loyalty is to its insured, the at fault driver, not to you. The insurance company is a for profit corporation that strives to pay claims as cheaply as possible in order to be profitable.